From the leader in sports writing comes Sports Illustrated Hockey Talk: From Hat Tricks to Headshots and Everything In-Between , a collection of stories that examine just about every aspect of the game: the players, the league and what it means to the fans. Since 1954 Sports Illustrated has been a leader in sports journalism. Okay, so they have traditionally neglected hockey, but in all those years they did compile some of hockey's greatest journalism. Now many of those articles are featured in this anthology. 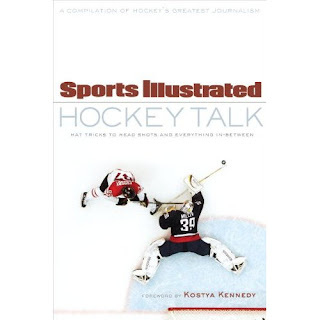 This collection of stories truly does contain some of the best hockey journalism within it's 330 pages. Writers such as Michael Farber, Kostya Kennedy, E.M. Swift, and Mark Mulvoy look at Wayne Gretzky, Maurice Richard, Gordie Howe, Don Cherry, Scotty Bowman, Mike Keenan, Mike Danton, the Soviets, violence and the 2010 Olympics. All in all it is a solid offering, but for $17 you can access all these articles for free - at least for now - at Sports Illustrated's wondrous online SI Vault. That is a resource that should be fully explored while it remains free. I can't imagine it always will be.